Meryem Vani is currently available to entertain at parties, corporate events, educational presentations and theatrical presentations. 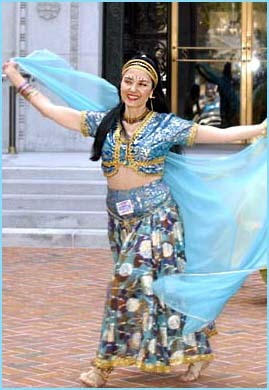 She also teaches belly dance in LOS ANGELES, CALIFORNIA individually or in group seminars with an emphasis on the beneficial aspects of dance movement and the empowerment of the student. Meryem Vani performs various forms of folkloric, cabaret and fusion bellydance. She is proficient in the use of cane, sword, daggers, fans and other props. She will also perform with her ball python by special request!